Baku is ready to strengthen and expand relations with Berlin in all spheres, Azerbaijan’s Deputy Foreign Minister Khalaf Khalafov said Oct. 4. He was speaking in Baku at a reception dedicated to the Day of German Unity. There are over 200 companies with German capital in Azerbaijan. Azerbaijan’s trade turnover with Germany exceeded $1.05 billion in January-August 2018, according to Azerbaijan’s State Customs Committee. Exports of Azerbaijani products for the period to Germany exceeded $619.5 million. 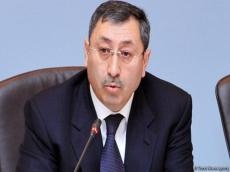 The deputy minister also expressed hope that Europe and Germany will contribute to the settlement of the Armenia-Azerbaijan Nagorno-Karabakh conflict on the basis of Azerbaijan’s territorial integrity.